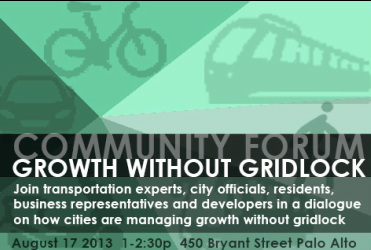 Our current campaign focuses on transportation, traffic and parking challenges experienced in the Downtown Area. As a major job center, Palo Alto has a significant influx of people during daytime hours. The wealth of retail and eating establishments downtown also draws many people to the area. In recent years, Palo Alto has become a highly desirable place to locate business and much commercial space has been added. As a result, parking, traffic and related transportation impacts have increased. GPA believes there is an opportunity to create better policies & programs to improve the analysis and management of these impacts based on several key principles. City Council has recently approved short term parking relief measures to address a perceived parking problem within Downtown neighborhoods. However, managing demand is as important as managing supply. Several major employers and regions with similar problems around traffic and vehicle trips (Stanford, Google, Facebook, San Mateo Hillsdale Station Area, Mountain View Whisman) have employed strong Transportation Demand Management (TDM) programs with success. For municipalities dealing with a patchwork of employers, independent non-profit Transportation Management Associations have formed to implement TDM programs. The city of Palo Alto currently lacks structured data on information to effectively tackle the transportation issues & parking crunch. What transportation modes do they take? Are there transportation alternatives (biking, walking, transit, carpooling, etc) workers/visitors can be incentivized to take? If Palo Alto can gather this information, and set up a data collection infrastructure to continuously monitor this data, better policies and programs can be implemented to study and manage the problem. Changes can be made more frequently to adjust to changing demand or economic fluxuations.